Didn't Chicken Little Say The Sky is Falling? 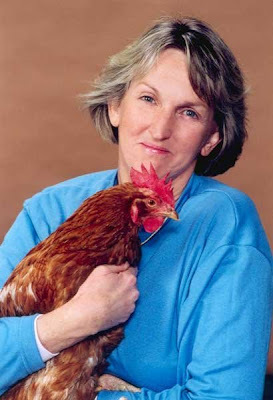 She'd Probably Really Cluck if She Saw Ingrid Newkirk's Body Disposal Plan. Ingrid Newkirk, the founder and President of PETA (People for the Ethical Treatment of Animals) has launched yet another media stunt on behalf or her organization. This is just one idiotic power play in her long history of grossing out and annoying people including those who do deeply care about animals. Newkirk has released her "Directions for the Dispostion of the Remains of Ingrid Newkirk." In addition to posting this macabe document online, Newkirk is shamelessly pumping her list of body parts to be distributed worldwide. For those who love barbecue, she states "That the 'meat' of my body, or a portion thereof, be used for a human barbecue, to remind the world that the meat of a corpse is all flesh, regardless of whether it comes from a human being or another animal, and that flesh foods are not needed." Such stunts make a mockery of the plight of animals and turn off people who might be inclined to contribute to a solution. Who wants to be associated with a group of nuts lead by a woman who wants her body ground into hamburger and served for dinner after her death? It makes it hard to take anything PETA says or does seriously. If you do care about animals, you can adopt animals from your local shelter. Both our cat and dog were abandoned pets and have brought joy to our home. If you can't adopt, shelters can always use a hand or donations. The local Boy Scouts sometimes visit on Saturday morning and wash the puppies. That makes them more appealing for adoption. As far as grinding up Newkirk and serving her for dinner, that's just disgusting but typical of the type of gimmicks PETA uses unsuccessfully to bring attention to the organization and to the founder rather than to actually encouraging more compassion and better treatment for animals. In fact, PETA kills 95% of animals they take in as reported by the Center for Consumer Freedom. In 2008, the death count for homeless pets was 21,339. PETA has a nonprofit status and a $32 million budget. It looks like they could actually do something for animals needing homes instead of making headlines with stupid stunts like the Newkirk barbecue manifesto.